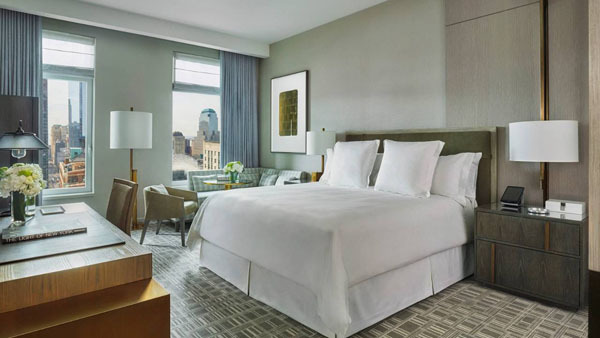 Adding a classic architectural landscape to the already magnificent New York skyline lays the Four Seasons Hotel New York Downtown. The Four Seasons is filled with 24 floors of the Downtown energy or maybe you’d rather find a quiet space and relax. Architect Robert A. M. Stern built this hotel to coincide with the luxurious aspects of other Manhattan residencies. The interior is chic and contains 189 rooms and suites some of which include a balcony, hello Instagram pictures. Feeling worn out? You’re in luck; just one of the many five-star highlights of the Four Seasons is the spa. Combining science, nature and various cultures comes a sensational service for your beauty and wellness needs. Whether it is a relaxing massage or nourishing skin regimen you’ll be able to escape the hustle of the city and unwind. One type of massage is the Aromatherapy where they blend essential oils that promote calmness and reduce anxiety while bring your body into balance. Are you a part of a duo? The Love Adorned, couples massage, is definitely for you with warm Rose Quartz massage and custom oils to spike that feeling of love and positivity. After having a day to recharge end the night with CUT by Wolfgang Puck that is among the finest restaurants and bars in Downtown. Everyone who is everyone comes to this restaurant whether you’re looking to make a deal with business professionals, unwind with friends or even a world traveller trying to get into the culinary scene of New York. Open for breakfast, lunch and diner you can grab a plate whenever works best or simply just to sip on a martini. Not only is the food menu to die for, but feast your eyes on the wine list and a true wino would be proud of the extensive list. To match the delicious items at CUT French Designer Jacques Garcia, designed the interior décor to be just as sophisticated as the food and drinks served. To give you just an idea of the item here is just a starter at CUT, Hand Cut Prime Sirloin Steak Tartare, Egg Yolk ‘Jam’, Crispy Beef Tendon. If that didn’t get your taste buds tingling then how about the Maine Lobster & Maryland Blue Crab “Louis” Cocktail, Spicy Tomato-Horseradish. For more information on the Four Season New York Downtown please visit their website and prepared to be amazed.